CMI Researcher David Reed leads the CMI project "Biomaterials for Critical Material Dissolution, Recovery and Separation." David received his B.S. and M.S. from Brigham Young University. His thesis focused on the cyclooxygenase genes required for the rate limiting step of the prostaglandin synthesis (Celebrex and aspirin are inhibitors of cyclooxygenase). He received his Ph.D. from the University of Idaho following research of the electron transport protein pathways for the hyperthermophilic sulfate-reducing microorganism, Archaeoglobus. David joined INL in 2000 as a postdoctoral researcher. While at INL he has specialized in molecular microbiological approaches for extremophilic enzyme expression, characterization, and detection. He has helped develop rate estimates for methane production in natural gas hydrate-bearing sediments, explored the potential for microbial remediation of radioactive strontium, and characterized novel enzymes and microorganisms for obtaining value-added products from biomass at high-temperature and acidic conditions. 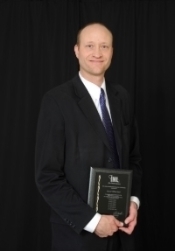 David enjoys mentoring students and is an affiliate faculty member at University of Idaho and Idaho State University. In April 2015, David offered a CMI Webinar: Recycling of Rare Earth Elements: A Microbiological Approach. A recording of the webinar is available; it runs nearly 39 minutes.